After brokering a peace deal in 2014, the deputy president is working to stop the country from being booted from SADC. Deputy President and The Southern African Development Community (SADC) facilitator Cyril Ramaphosa is in Maseru on on a working visit to assist Lesotho in the consolidation of peace and security in the kingdom, the presidency said Thursday. “The visit to Maseru is part of preparations for the forthcoming SADC Organ Troika to be held on 28 June 2016 in Gaborone, Botswana, to discuss the situation in Lesotho,” said the presidency in a statement issued by Ramaphosa’s spokesman, Ronnie Mamoepa. The meeting involves leaders from Botswana, South Africa, Mozambique, Zimbabwe, Swaziland and Tanzania. Ramaphosa arrived in Lesotho on Wednesday. 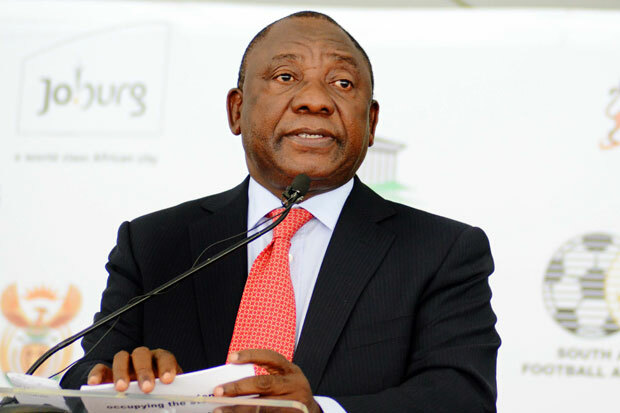 “During his visit to Lesotho, Deputy President Ramaphosa is expected to hold discussions and consultations with Prime Minister Phakalitha Mosisili and members of his government, members of the opposition political parties, college of chiefs, Council of Churches of Lesotho and representatives of civil society on progress regarding implementation of recommendations for the constitutional and security sector reforms,” said the presidency. Recommendations for the constitutional and security sector reforms were adopted by SADC during its Organ Troika meeting held in Pretoria on 3 July 2015. SADC urged the government of Lesotho to embark on a process of instituting such reforms assisted by the regional body as the basis of a long-lasting solution to the political and security challenges facing the kingdom. SADC called for a special summit to discuss Lesotho’s seemingly endless instability. The regional body had given Lesotho until Friday to submit a progress report about how it had implemented recommendations of a commission of inquiry established by SADC to probe the instability in the tiny kingdom after the brazen murder of former Lesotho Defence Force (LDF) commander Maaparankoe Mahao on June 25, 2015. Lesotho failed to meet Friday’s deadline but Foreign Minister Tlohang Sekhamane said his government would strive to submit the report this week. The report is expected to form the basis of the special double troika summit. A letter dated June 13 from SADC executive secretary Stergomena Lawrence Tax to Sekhamane explained that the summit was being convened by SADC chairman and Botswana President Ian Khama to review the situation in Lesotho, about six months after Lesotho received the report of the regional body’s inquiry. Ramaphosa brokered a peace deal last year after a coup attempt in 2014. The deputy president is expected to return to South Africa later on Thursday. SADC will convene the summit amid escalating political tensions in Lesotho with an alliance of civic groups recently staging a well-attended protest march to demand implementation of the SADC recommendations. The civic alliance, including key trade unions, business, and church groupings, has threatened more protests if there is no progress in implementing the recommendations. The Lesotho government has pleaded for their patience, saying reforms cannot be implemented overnight. African Union Commission chairwoman Nkosazana Dlamini-Zuma recently weighed in with an uncharacteristically strongly worded statement condemning “the deteriorating state of human rights, rule of law, and constitutionalism in the Kingdom of Lesotho”. This followed an attack on the house of arch government critic and vice-chancellor of the University of Lesotho Professor Mafa Sejanamane last month. At a recent press conference, the bosses of the Lesotho Mounted Police Service denounced the spate of killings in the country. The opposition All Basotho Convention (ABC) claimed four people recently shot dead at a public bar were its supporters but police attributed the killings to criminality. The opposition has been generally quick to claim that people who died in a spate of shootings this year were its supporters. But the killings could also be attributed to criminals. The Lesotho government hit back at Dlamini-Zuma with Police Minister Monyane Moleleki saying Lesotho “was not a jungle” and did not deserve such a hard-hitting statement. Central to the recommendations of the SADC inquiry – led by Botswana Judge Phumaphi Mphapi – is the dismissal of reappointed LDF commander Tlali Kennedy Kamoli, whose actions are seen as being central to the crisis in Lesotho. The recommendations include the prosecution of all those behind the killing of Mahao, Kamoli’s predecessor and archenemy. They also include key constitutional and security reforms to curtail the army’s long history of political meddling and the return of all exiled opposition leaders. All Lesotho’s opposition leaders, led by former prime minister and ABC leader Thomas Thabane, are living in South Africa after alleging assassination attempts by members of the LDF. Despite the SADC recommendation to fire him, Kamoli is still firmly ensconced in his job six months after Lesotho received the SADC report and indications are that he will not be fired. In fact, some critics say he is running the country. Even though the government has largely been mum on his fate, a spokesman of one of the main parties in Prime Minister Pakalitha Mosisili’s coalition declared recently that “Kamoli would not go anywhere”. Opposition parties, who are speaking jointly, say they are not surprised by the government’s failure to submit the report by Friday as demanded by SADC, because the “government has nothing to report” and “has done absolutely nothing to implement the recommendations”. The crisis began when Kamoli attempted a coup against Thabane on August 30, 2014 – a day after Thabane fired him as LDF commander. This was all in the wake of fractious relations between Thabane and his then key coalition ally Methotjoa Metsing. A deal brokered by South African Deputy President Cyril Ramaphosa resulted in early elections in February last year which brought Mosisili, who had ruled Lesotho for 14 years before being ousted in 2012 elections, back into power in a new pact with Metsing, who retained his post as deputy prime minister. Mosisili’s government was then accused of launching a reign of terror against opponents, with Kamoli being at the centre of the controversy. Mahao, whom Thabane had appointed to replace Kamoli, was murdered in a brazen raid near his farm by LDF officers, plunging the country into crisis and resulting in SADC’s intervention. Dozens of soldiers accused of loyalty to Mahao were arrested and tortured. Many are still in custody pending courts martial for plotting an alleged mutiny. Lesotho was nearly booted out of SADC after initially refusing to accept the SADC inquiry report before a last-minute change of heart by Mosisili, who accepted the report in January this year. Lesotho had expected to be asked for a progress report at a SADC summit due in August. The fact that it’s being asked to account earlier could be an indication that Khama is taking the matter of resolving the crisis in the ever-squabbling kingdom seriously.